Gain access to over 450 professionals who guide budget development and purchasing habits of university and institutional leadership. 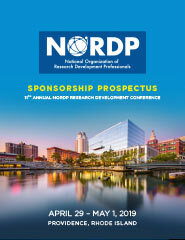 The Sponsorship Prospectus features a variety of NORDP Conference sponsorship opportunities. Sign up for a sponsorship package using the link below or contact Gina Petrick ([email protected], 443-244-4780) for exclusive opportunities and custom options. According to a recent study, 72% of consumers positively view brands that provide meaningful interaction and experiences and 74% of feedback establishes that engaging with brands that create these experiences makes them much more likely to buy their product. NORDP sponsorship will allow you to reach your specific audience and build long-lasting relationships. Research indicates that being the right kind of sponsor means much more to your target audience than being just an advertiser. NORDP sponsorship is a great way to demonstrate your authority as an industry expert and consequently get heard. By providing good quality, engaging content, your company can definitely gain credibility and respect. Moreover, sponsorship helps generate awareness around your brand and get additional exposure through various media channels.